Ham and cheese never tasted so good! Kids go crazy over them and the adults can’t stop eating them, too! Quick-and-easy recipes are what parents look forward to, like this very simple recipe that kids love. Simply roll the ham with the cheese stuffing, then fry them. Enjoy the melted cheese oozing out in every bite. Lay one slice of ham flat on a plate. Put the quick-melt cheese, mozzarella and parsley on the ham. Roll tightly then secure with a small food stick to close. Prepare 3 bowls containing these 3 ingredients separately: lightly whisked egg, flour and breadcrumbs. 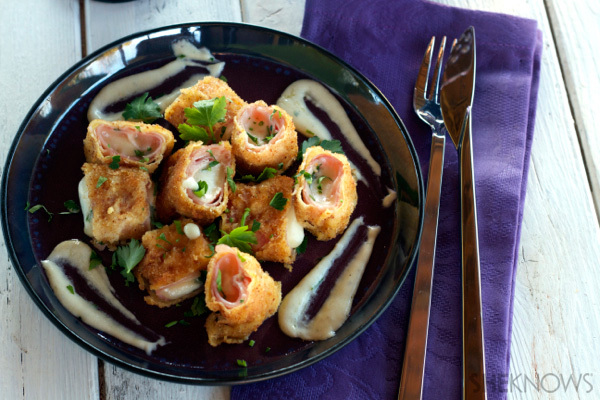 Coat the ham and cheese roll with flour. Shake off the excess. Dip the roll in the bowl of the whisked egg. Dip it next to the bowl of the breadcrumbs then shake off the excess. In a wide saucepan, over medium heat, warm up the extra-virgin olive oil. When it’s hot, fry the rolls until they turn golden brown. Slice each long roll to 4 bite-size slices.